Some celebrities who started young in their career couldn’t have much privacy in their real life because of the people who keep on following and idolizing them keenly. A lot of their delightful can’t help but notice these artists as they grow up very attractively. Some of you might still remember the cute little crybaby named “Lottie” in the Kapamilya TV series “Princess Sarah” which became sensational in the Philippines. A lot of people might seem to miss this renowned crybaby as she had grown into a beautiful lady. 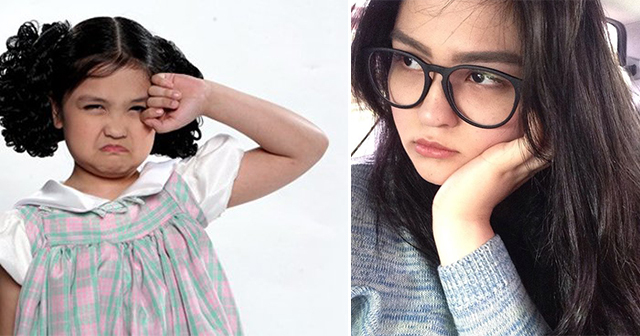 Her name is Noemi Oineza, 18-years old, and starred as Lottie Leigh in the TV series Princess Sarah with her fellow “Going Bulilit” friends, who are now one of the Myx VJs, Sharlene San Pedro, who played the role of Sarah. She was also the sister of the Ex-PBB housemate, Jane Oineza. She also took a role on another Kapamilya series “Betty La Fea” in 2008 after her break in her previous TV series. She played the role of the young Betty which was starred by Bea Alonzo after she gets older. She also became one of the casts in Mira Bella alongside Julia Barretto and Mika Dela Cruz in 2014. She also became a part of the Tweens of Pop (T.O.P.) with Mika Dela Cruz, Alexa Ilacad, and Angel Sy which became a sensational Pop-icon in the Philippines that became a notable milestone in her career. It was almost a long time since we’ve heard something from her, but they had a mini-reunion with her Going Bulilit friends last November. She also shared a photo of their reunion on her Instagram account. All of these lovely young girls grew up to become an elegant lady who made a lot of followers and fans all over the internet. We can’t wait for them to become more refined and step up to become more successful artists. What are your thoughts about Noemi? Share it with this article!